Description : Simple, assertive, classic. For men and women, the cK Bold is direct and unassuming. Cool easy symmetry with precise performance: modern purity of design transformed into techno-function. A seamless curve of leather and a bold face equal an assured style. Discreet details in stainless steel; the dial in silver or black. 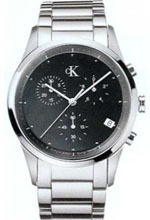 Hours, minutes, seconds, chronograph, date, 30 meters/100 feet water resistant.